Revel in me...: Polka dots. Dinner on the day Jing and I arrived home from Korea, at one of our family's favorite restaurants, Grand Palace in Pavilion. Was still feeling quite dazed from all the traveling and packing/unpacking, so I opted for a super simple and fuss-free outfit featuring one of my new go-to shorts. Sorry ar, I don't know why I looked like I was super-imposed onto the picture wtf. Crappy photo from iPhone 'cause I forgot to bring my DSLR! I paired a pleated top with lace trimmings that is actually a skirt wtf (the strings are meant to be overall strings) with a polka-dot shorts from AZORIAS. Perfect roomy outfit for a big meal, hehehe. I have always wanted a pair of polka-dot shorts, and specifically in a B/W tone 'cause it seems fun and preppy yet very classic! The only accessory I had on was this gorgeous necklace I got from Korea. Basically I was going for a laidback, resort vibe but still with a touch of glam factor. 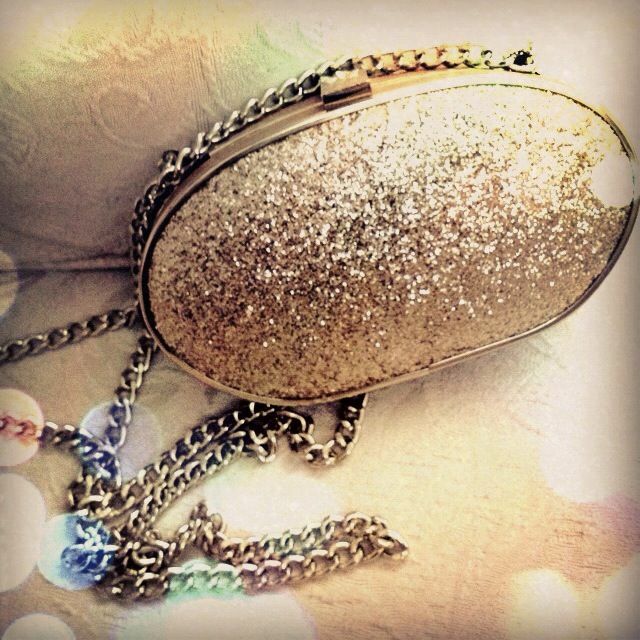 As part of the chilled-out/ luxe vibe, I went with a small bag-- a glitter clutch that I stole from my mom, hehe. Speaking of AZORIAS, its first ever sale is up! The sale will be on for a limited time only, after which everything will revert back to its original price. Everything is being snapped up really quickly though, so do hurry!